If you wanna hear one of the most home-run hitting voices to the heart you’ve heard anytime soon, then Stella Stephney is your draft pick. When it comes to R&B, Stella is one of the biggest sighs of relief that there are still some artists out there writing and producing the genre the way it was meant to. A genre of sensuality, passion, and unrelenting emotion. And emotion just might be the perfect word to utilize here because Stella Stephney‘s LP Emotional is exactly just that. But then again, so much more to it as well, because the talent factor is far beyond what you’d expect. With a tender and blissful vibrato that’s soft and soothing, Stella drives this collection of heartwarming tracks forward with dynamic writing structures, a natural vocal approach, and precision with unstoppable likability factors. Her performance on these songs have Whitney and Janet feel to them, but Stella‘s voice is the main defining factor of every track on Emotional. 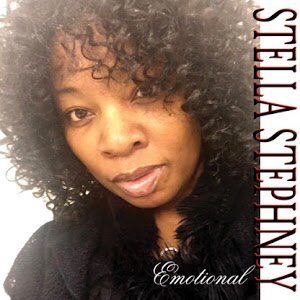 Her song “I’m Completely Yours” beautifully demonstrates Stella‘s 5-octave vocal range and natural talent. The song caresses you with its vibe, soothing nature, and vocal parts that feel like the best back rub you’ve ever had. It’s immediately apparent that R&B is in good hands with someone like Stella Stephney driving the genre forward, and perhaps bettering it altogether. Same goes with her other ear-catchy soother, “It’s Funny How I Still Love U”. Another song with production value that beautifully showcases Stella‘s singing ability in the most effective and innovative way. You can tell from start to finish that it’s true passion for the R&B genre that put the perfect takeoff and landing grounds for this album. And even though she’s been singing since age 5…the true soul of music is what really makes Stella Stephney shine on every track of Emotional. We can’t stress enough how beautifully talented this artist is. If you’re into a R&B the way it was meant to be, then Stella Stephney is going to be on your shelf of favorites.